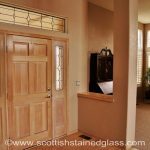 Painted stained glass is beautiful and as difficult to create as it looks, however, it is an incredibly rewarding art form that we at Scottish Stained Glass have perfected over the last 2+ decades. 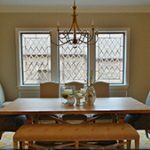 This makes us one of the few experts on painted stained glass in the Kansas City area and we are proud that when churches in the city are looking for original or restoration painted stained glass, they come to us! 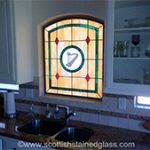 And rightfully so–at Scottish, we can successfully take on and complete any type of painted stained glass work. 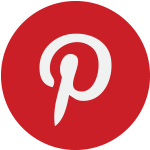 For more information on the fascinating process that goes into creating one-of-a-kind works of painted stained glass art or restoring one, continue reading for the particulars of our beloved craft. 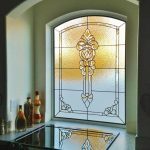 Painted stained glass is simply stunning and, as it happens, is a unique way to add character and charm to your Kansas City church–there is no question about that. It is also a feature many churches in KC already have. 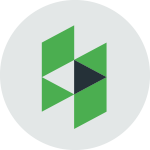 On the surface, it may look like a relatively simple art form but the process is quite detailed and could even be considered scientific. 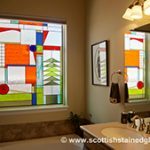 This is because colors on painted stained glass are brought about through complicated chemical interactions of different minerals and oils, which result in various majestic colors. 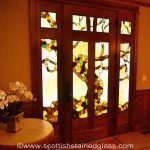 The most basic method for painting color onto stained glass is for the artist starting with colored glass and then applying special black paint made up of oils and minerals onto it. 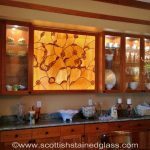 This starts a chemical reaction that changes the glass into rich colors you see on church and home windows and is completed when the piece of glass is fired in our kiln at 1250-1450 for a couple of hours. After the glass comes out the paint/color is permanently melted into the glass. Now that the paint is part of the glass it can never rub off or be removed. 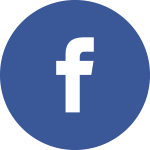 The second method involves clear glass. 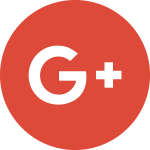 During this process, colors are painted on a clear piece of glass one at a time and fired in between layers of color to build up layers of shading or color. 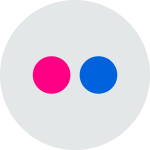 Any color that involves the use of yellow can be particularly difficult in this method as the chemical used for yellows color (silver staining) is very toxic and will destroy other colors. 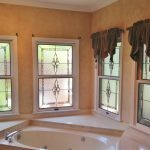 For this reason, when trying to achieve the color green for instance, the toxic yellow must be painted on the opposite side of the glass as the blue paint in order to keep the yellow from damaging the blue paint. 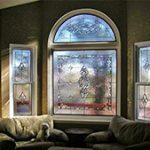 Restoration projects for painted stained glass come with their share of challenges but are definitely worth the time and effort involved in restoring the beauty of your glass. The main challenge is figuring out precisely what type of techniques the original artist used. For example, sometimes artists would use black paint on their glass but scrap some of it off with a stick to add texture. This same method was also used to etch in individual elements like blades of glass. No matter what type technique was used, our artists work hard to mimic them exactly– sometimes even doing multiple iterations to get it right. 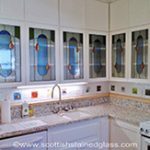 Learn more about the history of stained glass here or watch the video below. 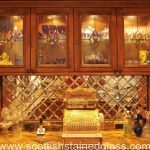 Here, at Scottish Stained Glass, we take great pride in what we do and always love the final, beautiful outcome! 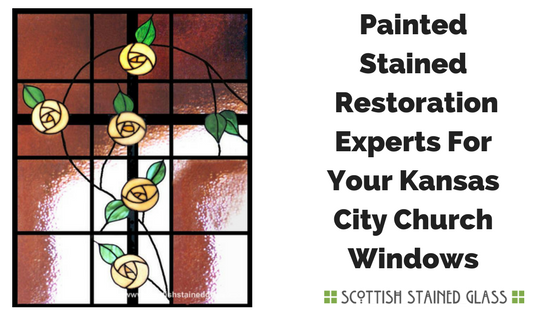 Contact us to find out more about original or restoration painted stained glass for your Kansas City Church today!